England have a lead of 250 runs and India will have to show a lot of character in this match to earn a draw. India (1st innings): 107 all out. England (1st innings): 396/7 declared. England in one innings: 88.1 overs faced. India, both innings combined: 82.2 overs faced. England’s bowling attack knows the conditions and how to exploit them. India’s batting, on the other hand, has shown neither the technique nor the mental fortitude to fight their way through tough times on the this tour. WICKET! Ishant is the last man to be dismissed. There was one fielder at leg-slip and Ishant found him. India scored 107 in the first innings and 130 in the second. Their batting – in difficult conditions no doubt – was just not good enough. England have won by an innings and 159 runs. Another delivery takes off and hits Ashwin high on the bat handle. Once again, it hits his bowling hand. This looks like it was painful. WICKET! The old heave-ho from Shami and it missed the ball completely. The ball hit the back leg. But with Ashwin batting at 30, was this the shot to play? It won’t change the result of the game but these are the little things that irk. Four wickets for Anderson now. India’s review works and keeps Shami in the middle. It had initially seemed like Anderson’s short ball had done the trick and the umpire agreed too. But the reviews showed up a flat line. There was definitely some sound there. WICKET! Bowled. Anderson was just too good for Kuldeep, who gets his second duck of the match. He set Kuldeep up with the one that went across the line and then change the line ever so slightly. Boom. WICKET! Woakes back into the attack and he traps Pandya LBW. The umpire initially gave it not out but Woakes was convinced and the review showed he was correct. Solid innings by Pandya comes to an end. The partnership with Ashwin was worth 55 runs. Wonderful partnership for Pandya and Ashwin. 51 off 59 balls. They have taken on the attack, scored runs, hit boundaries and taken a few blows on the body while doing it. Anderson back into the attack after a long rest. He replaces Curran. A very different challenge for the batsmen. Wonderful straight drive by Pandya in the last over. Broad pitched it up and Pandya just pushed at it. Lovely timing. The runs continue to come but there are enough edges and plays-and-misses to tell the batsmen that this won’t last long. At present, Pandya and Ashwin are just trying to make the most of their time in the middle. Broad can usually be classified as a seam bowler, most dangerous with the ball changing its line after hitting the deck. Here he's deliberately bowling inswing, moving the ball in the air. That's what accounted for Pujara and DK. Unbelievable skill. Batting is anything but easy. Another one jags back and hits Pandya on the thigh. That must’ve hurt. But they are trying to hang in there. Ashwin and Pandya doing their best to hang in there. England are on the attack – no third man, no fielders in the deep and that might mean a few quick runs. 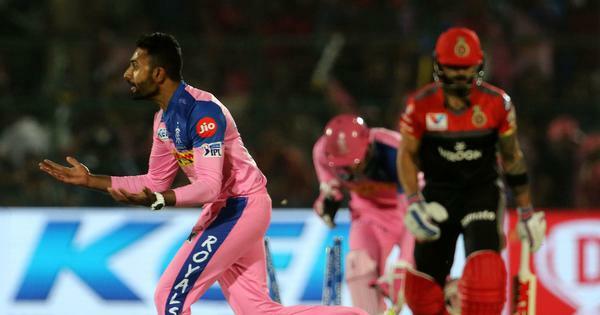 Two lovely fours in the last over – one from Ashwin’s bat and one from Pandya’s. Since the Australia tour of 2014-15, this year's South Africa tour was our first outside Asia and West Indies. How do you expect to have a technique to handle Anderson and Broad based on that kind of conditioning and experience? Now Ashwin gets hit on his spinning figure. Curran the bowler and it took off from a good length. This looks like a dangerous pitch to bat on now. Hardik in the last over and Ashwin now. Broad starts off with a maiden and Hardik got a nasty blow on his thumb. How much longer will this innings last? Play stopped due to rain. But it doesn’t look like this will be a long break. Clear skies in the distance. What a session for Broad – he started the session on 3-1-7-0 and by the time the rain came down, his figures read 11-5-16-4. His spell in this session: 8-4-9-4. WICKET! Karthik has been trapped LBW first ball. He reviewed it but it would have hit the middle of the middle stump. 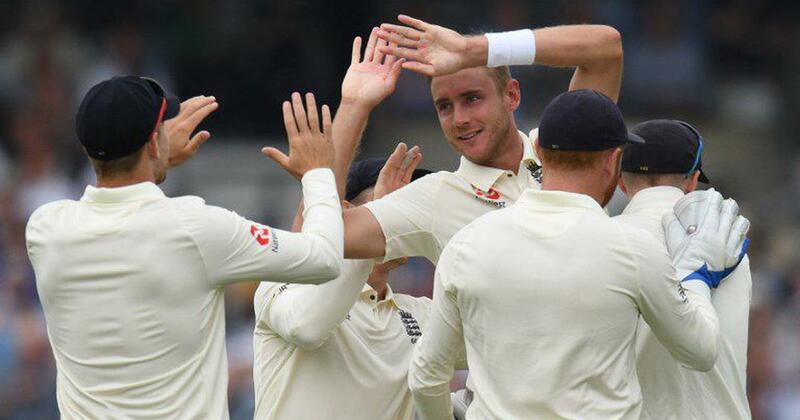 Amazing spell by Broad, he has claimed four wickets in this session alone. Pant for the next game? WICKET! And we have managed to jinx him. He gloved a shortish ball and was caught in the short leg region. The umpire gave him out but Kohli reviewed it right away. Replayed showed that it hit the glove. Even with the back injury, Kohli looks the best of India’s batsmen. What does that tell you about the rest? It's been 10 overs since Kohli has come out to bat and he has faced only 20 balls because he rotates strike and doesn't allow bowlers to keep bowling at him. Some basic stuff other batsmen could try to do. Pandya joins his skipper in the middle. And it has started drizzling again. BOWLED! What a ball from Broad. He was looking dangerous and he got this one to swing in sharply. Pujara could not react to it, and it went on to destroy the stumps. Pujara was bowled many times during his county stint and this should start to worry him. And the fifty comes up. India have battled hard. Pujara has faced 82 deliveries and in his own way, kept England at bay. Maiden over by Broad but what an over it was. He was beating Pujara, hitting him on the glove, bowling a probing line. Wonderful spell and he is looking very dangerous here. His back may be troubling him but if Kohli thinks the ball is there to be hit, he will hit it. And that is what happened. It was a bit too wide from Broad and Kohli played a bit away from the body but he timed it well. Stunning shot. Later in the over, Broad got his own back with some wonderful deliveries. Tantalizing battle this. Five off Curran’s first over and it included a wonderful straight drive from Pujara. The ball was a bit too up and he helped himself to four. That will make him feel good. Kohli played one ball but he looked really uncomfortable there. The couple of steps he took after playing the shot were awkward and his face wore a grimace that had its own story to tell. WICKET! Poking at the ball that was way outside the off-stump and Rahane is walking back. He looked at the sky after the edge was caught, this was a ball he could have left well alone. Why? Why? Why? India are trying to save a match here right? Occupying the crease should be all they are thinking about... but still, a lapse in concentration. Kohli is the new bat. Very slow and steady. Pujara and Rahane are now one short of India’s second highest partnership in the match – they now have 22 runs, 11.5 overs, RR: 1.88. This is more like it from the Indian batsmen. The odd ball is still going past the outside edge but there seems to be a sense of calm in the middle. Not batting with Kohli might be doing wonders for Pujara and Rahane. In a sense, the pressure is off. Genuine edge from Rahane’s bat fell just short of Cook at first slip. Little Rahane could have done but he played with soft hands and survived. This is about survival. Make no mistake, This is about survival. Earlier in the over, Rahane got four through the covers. Maiden over. Anderson will keep plugging away all day, all night if need be. Steady does it. India need to hang in there long enough to make England nervous. That is easier said than done but England will also know that rain is expected tomorrow. Make them nervous, make them do something different. Steady start after the break by Woakes. Ball is moving around and India’s batsmen will never settle as long as conditions remain this way. Play all set to resume. We have only lost 5 overs so far! But the day could be extended all the way to 2330 IST. More rain is forecast for today though. The rain has stopped, play will begin by around 1830 IST. The rain is coming down that little bit harder now. They cut to visuals of Virat Kohli in the dressing room and he did not look comfortable at all. That back is troubling him no end. Play stopped due to rain. Persistent drizzle has been on for a while and the umpires – in a bid to save some time – have decided to take an early lunch too. The form of the openers has been so poor than you wonder if they need to be discarded completely. This cannot considered be an aberration anymore. They were bad in SA and they have been worse here. Another solid over by Anderson. With Pujara and Rahane in the middle, you can expect long spells at each batsman. Woakes comes into the attack and he will be feeling pretty good about his game at the moment. WICKET! It is that man again. Anderson with another delivery that seamed into the batsman and trapped Rahul LBW. Rahul batted just 29 minutes and that means Virat Kohli won’t be able to come out to bat. Rahane has to come out. Steady over by Broad but there seems to some dew around. Point to note: Pujara’s calls are really clear and loud today. Meanwhile, Murali Vijay also became the sixth Indian opener to bag a pair in Tests. The wicket of Murali Vijay today made Jimmy Anderson the leading wicket-taker in India-England Test matches as he moves ahead of Bhagwat Chandrasekhar's tally of 95. Anderson strayed onto the legs and Rahul helped himself to another four. A rare event for the England paceman though. He usually is very tight with his line. One lovely four through the cover-point region for Rahul to start things off for India. A vital innings for Rahul, who needs to show that mentally he is up for the fight today. Indeed, a vital innings for every Indian batsman. Three overs gone, not a single run on board and a wicket lost. Tough start for India, Anderson is on song. He isn’t quite bowling just outswingers. Mixing it up with some good seam bowling too. WICKET! Anderson got that one to jag back, it took the inside edge and Bairstow took a good catch. A long walk back for Vijay. The India opener has been off his game for a while now and the Indian selectors will be worried... should be worried. Another maiden. Broad hasn’t been at his best in the series but England would love for him to get going today. Slight drizzle coming down. Kohli was off the field for 37 minutes. So in case, India lose two wickets early, he won’t be able to come out to bat. Anderson starts off with a maiden. England didn’t need to bat today is the popular opinion and perhaps they didn’t. But what is done is done. How India will come out and bat is the big question no one can answer. Will India look to play out time because a positive result is beyond them? Or will they show intent and continue to try and play shots? WICKET! Curran holes out in the deep and England captain Root declares the innings. England lead by 289 runs. England’s batsmen are throwing their bats around. A four and a tennis-style hook shot for a six for Curran and another four for Woakes. Root is on his feet, it’s cloudy now and the declaration is imminent. The lead is already up to 271 and this really a bit daft from England. They should be looking to crush India and 250 should be fun. Instead, they are playing out time. For what purpose? England continue along but what total do they have in mind? Most would reckon that they already have enough of a lead but it looks like Root will feel more comfortable if they are 300 ahead. Never quite got that talk about a psychological barrier. A cracker of a session for Shami though. In just 25 mins, he has gone past the bat 8 times. Yesterday, in the whole day, he went past the bat 11 times. Don't let the weather forecast dictate your tactics Joe. Two fours in that over. One going just wide off Rahane at third slip and and another pushed through the cover region. The two fours brought that up the fifty partnership of the duo – it took them just 59 balls. Interesting observation being made by Ian Botham on air about how the slip are just too narrow. A better placing might have seen that genuine edge go to hand. Shami starting to hit the straps a little now and he went past the outside edge more than a couple of times. He is working up a good pace too. But England’s bowlers, sitting in the dressing room, will be happy with what they have seen so far. England lead by 257 runs. Maiden over. Good length from Ishant. A touch full if anything. In England, you want to be on a good length and the odd ball is keeping low too. Kohli has a back strain issue which has continued from yesterday and has not taken the field in the morning. As if India didn’t have enough problems on their plate. A dry day has dawned and the ball, which is just one over old, has not done too much. 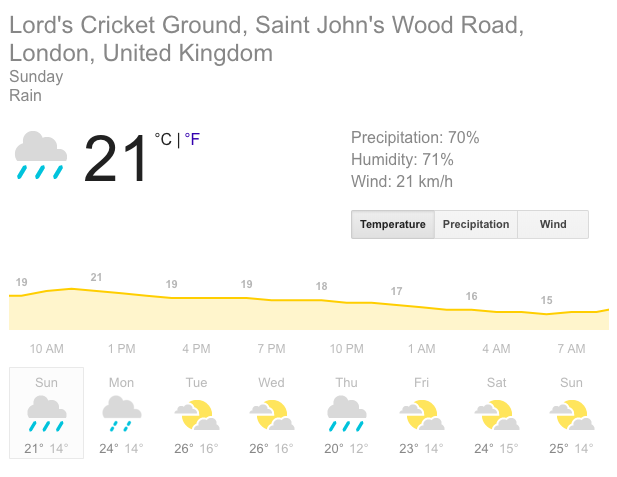 England will probably want to bat as long as it is sunny if possible and then declare as soon as it becomes overcast. One can’t imagine what England are worried about but it seems like they want to bat on for a bit. “Over the past few months, experts and former players have wondered whether Kohli takes any advice from seniors in his team. At face value, it appears not many question his calls even if they are not ideal. Kushal Phatarpekar on Kohli’s captaincy: Read the FULL piece here. Were India missing a seamer? Yesterday, after close of play, Hardik Pandya weighed in on the debate. Day 4: 65% chance of rain. Day 5: 30% chance of rain. Almost everyone thinks England should declare but Woakes walked out wearing his gloves and holding a bat. What are they thinking? So will England opt to bat a little more or will they reckon they already have enough on board? Either which way, given how India have batted 250 runs is a lot. Rain or sun is good news. The official Lord’s Cricket Ground’s twitter handle said the sun is peeking out but the BCCI twitter handle says it is drizzling. Hello and welcome to Day 4 of the 2nd Test. And what is the weather like today? It is perhaps safe to say, India’s hopes rest with the weather. Rain is forecast for Sunday and for Monday. But how much of it will we see and how will it affect the game.